Compact analog travel radio featuring AM, FM and 9 shortwave bands. Very happy with this economy purchase of an analog AM/FM/SW. 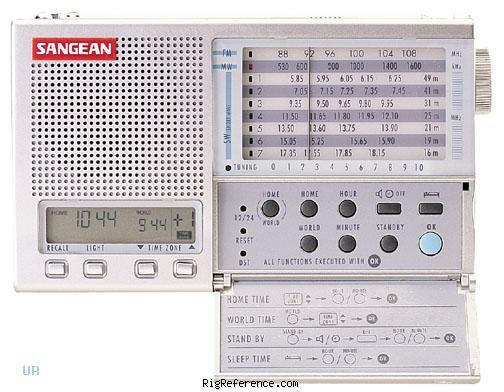 The dual clock display is the best, wish my Sangean ATS606A, and Sangean ATS818 had it. The radio would have been better looking and finish more durable had it been molded in color - grey or black - instead of painted silver. It is the only Sangean I own that is not color molded. I also have a Sangean DT400W for Ultralight DXing. (A lot of fun in it's own rite.) The PT633 has very smooth and accurate tuning and I like that there is no muting between stations as on my digital tuners, my reason for the purchase. My ATS818 is not modified and if tuning slowly it doesn't mute. I think that the PT633 probably qualifies as an ultralight for AM DXing. I have picked up many distant US stations from out of the hash that is 20 miles north of Detroit, MI. It has excellent FM stereo by earphone. As you can tell I am thoroughly enjoying this small radio. Last evening at 0300 UTC I easily separated Radio Russia, Radio Romania, CRI, and Radio Taiwan all jammed together at the same spot. My intention wa to us the PT633 as sort of a spotting scope for my ATS818 much as a spotting scope is used for a larger telescope in astronomy if you can relate. It was good money spent. The model is discontinued but still available in the US. Again that dual clock, with alarm and timer function, is nice. Better choice than Sangean PT10 or SG622 for the purpose I intended. It comes with a case and earphones. Estimating the value of a rig can be challenging. We collect prices paid by real hams over the years to help you estimate the current value of the Sangean PT-633 Pro Travel. Just bought or sold this model? Let us know what you traded it for and help other ham operators!